If Bridgett Howard isn’t fishing, she’s probably talking about it, writing about it or reading about it. She is hooked on the sport, which is dominated by males. Howard, who works for a sign company, has turned her passion into her favorite pastime. 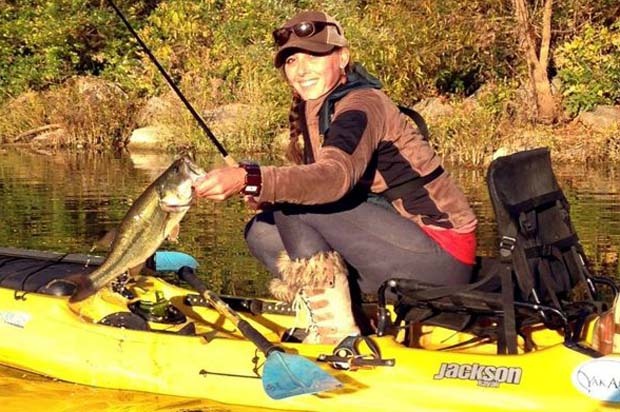 She writes a column, “The Kayak Corner,” each month for Sportsmens Digest, co-writes another column with local guide Joey Monteleone in The Angler Magazine (Middle Tennessee Edition), is a speaker at seminars and also serves as a representative for Jackson Kayak and Werner Paddles. Howard realizes how unusual it is for a woman to be as involved in fishing as she is, but she doesn’t feel out of place. Howard said she is trying to follow in the footsteps of female pro anglers such as Sarah Meier, Ontario’s Ashley Rae and Pennsylvania’s Callie Shumway. “Callie is from right around the same area where I grew up, and she’s 21 years old and building cabins in the woods,” Howard said. “That’s so incredible to me to see these women not focused on posting pictures of themselves trying to be beautiful, but posting pictures of themselves with big fish. Photo credit South Carolina Sportsman. Even when her schedule is packed, Howard finds time to fish — “I’ve taken many lunch breaks over at Manson Pike on the greenway and fished,” she said — with her favorite target being largemouth bass. She most often fishes from a kayak.